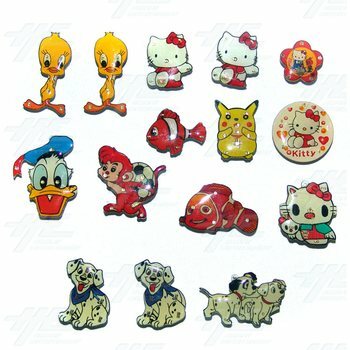 An assortment of magnets featuring popular cartoon characters, including: Tweety, Hello Kitty, Pikachu, 101 Dalmations, Donald Duck and Nemo. Contains a total of 15pcs. Each Magnet is between approximately 2cm - 3cm in size. Each Magnet is between approximately 2cm - 3cm in size.